When you’re bringing an imaginary creature to life through CG, you can make it move however you want. But when you’re bringing a toy millions of kids spent their childhoods with to the big screen, you need to use every trick to make them move as believably as possible—including something as simple as just playing with stuffed animals on set. 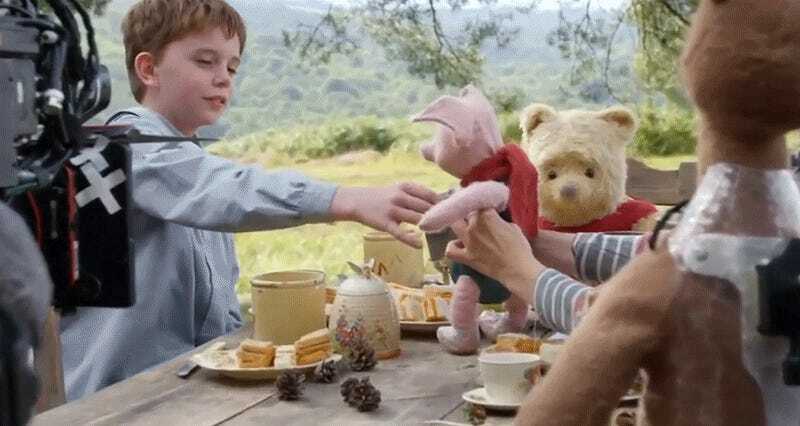 BBC Click talked to Chris Lawrence who served as the visual effects supervisor for last year’s Christopher Robin; a film that included photo-realistic, real-life versions of Winnie-the-Pooh, Piglet, Tigger, Eeyore, and other characters from the Hundred Acre Woods. In addition to breaking down the staggering amount of detail visual effects studio Framestore created for its 3D models of the plush toys, the interview includes some fun behind-the-scenes footage of how things played out on set. Bean bag versions of each stuffed animal, covered in tracking markers, were used on set when human performers would be directly interacting with or holding the characters to ensure their movements matched the size, position, and weight of the plush digital replacements that would be added in post-production. But for scenes where plush characters moved and walked around all on their own, on-set performers simply played with physical toys, the same way a child would, to bring them to life. Those performances and movements were later used as reference by the artists who animated and added the digital versions of Pooh, Tigger, and the other toy characters to a scene, to help reinforce the idea that it was a child’s imagination that originally brought them all to life. It’s also nice to know that there are actual jobs out there that involve playing with toys—a skill many of us have continued to hone our entire lives.